Guantánamo Public Memory Project – What Is It Like to Be Transported to GITMO? What Is It Like to Be Transported to GITMO? In 2007 Nonny de la Peña and Peggy Weil were awarded a MacArthur sponsored residency at BAVC (Bay Area Video Coalition) as part of their New Media Producers Institute to create Gone Gitmo, an installation of Guantánamo Prison in the virtual environment of Second Life. They built an interactive experience, integrating Defense Department footage of Guantánamo from de la Peña’s 2004 documentary, Unconstitutional. As Guantánamo Prison was, and continues to be, off limits to most citizens and press, the choice of Second Life offered the chance to create an accessible, albeit virtual, version of the inaccessible real prison camp. Visitors begin the experience by stepping into a C-17 transport plane and are abruptly transported, hooded in the form of the screen going black, to a cage in Camp X-Ray. 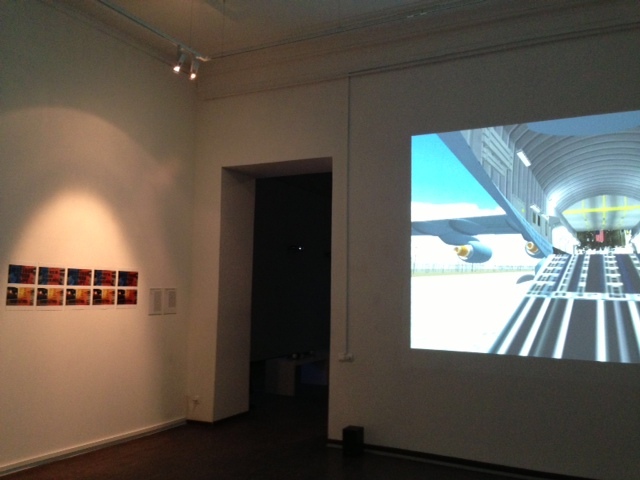 Once there, free to wander around, visitors are confronted with Defense Department footage, photographs, recordings and interviews from de la Peña’s film. The installation was expanded to include Camp Delta where a visitor is confined to a cell to experience a Legal Black Hole question and answer series documenting the loss of habeas rights. Sensitive to the issue of violence in games we made the decision not to directly depict prisoners or interrogation and instead created a series of contemplation chambers – an area with changing exhibitions including pages from Poems from Guantánamo, recordings from PEN USA’s Dirty Wars performance at Joe’s Pub in 2007, and a “Close Guantánamo” gallery devoted to calls to close the prison. Finally, the original build had an amphitheater, Habeas Commons, where we hosted several live events including Seton Hall Law School’s Constitution Day conference on interrogation methods in 2007 and Culture Project’s Blueprint for Accountability in 2010. Online and available 24/7 the installation has been visited by individuals and classes from around the world. 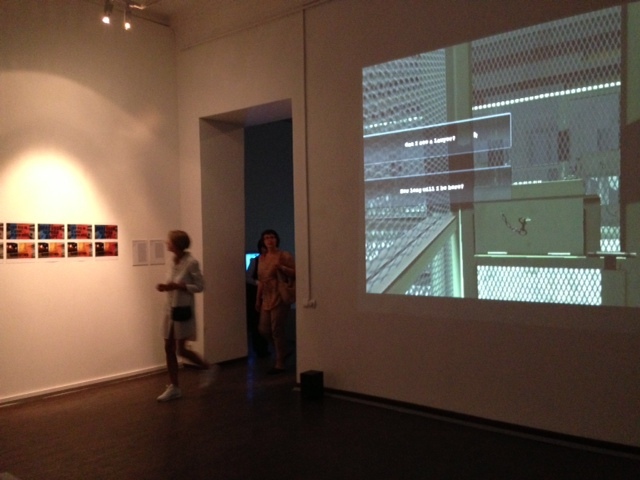 In response to an invitation from the Moscow Media Arts Forum to exhibit Gone Gitmo in MMOMA (Moscow Museum of Modern Art) we have rebuilt the project in the game engine Unity3D. The opening was June 24th and the exhibition, Mockumentary, Reality is Not Enough continues until July 26th. 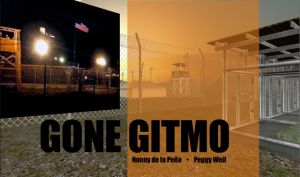 Gone Gitmo was the inaugural project for Immersive Journalism, the use of immersive technologies to allow first person experiences of an environment to tell a non-fiction story. The creators explain that viewing the archival footage from within the virtual environment gives context to the news reports beyond what you might experience watching the same footage on a Youtube page, and the experience of being locked in a cell, even a virtual one in a medium where walls have no substance, gives context to the loss of habeas rights. 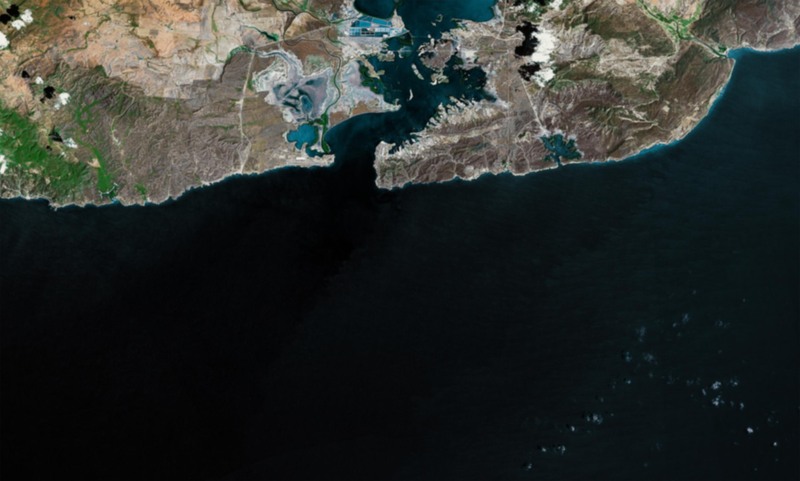 Like the Guantánamo Public Memory Project, this project aims to raise awareness and foster debate about the larger questions the site represents. Click here to learn more about Gone Gitmo. 2 Comments	to: What Is It Like to Be Transported to GITMO? Imagine if you were told you had HIV, and you had no idea if it was true? Imagine if your biggest fear was being sent back home? Imagine if you had no idea where your family was or when you would see them again? Imagine if whatever rights you thought you had no longer existed? In recreating one of the most infamous prison camps in the world, the Gone Gitmo allows visitors to have experiences such as a Legal Black Hole question and answer series documenting the loss of the right to habeas corpus. The contemplation chambers are areas with room for rotating exhibits, and I think it would be useful to expand the exhibit to explore the experiences of those who were once there, such as the Haitians at Camp Buckeley. Leaving out the experiences of those detained at Guantanamo before the 9/11 era would not be showing the whole picture. The combination of these two experiences, that of the post- 9/11 detainees and that of the Haitians would give visitors more insight into each; allowing them to place themselves in the shoes of those detained and interrogated. I’m also curious about the basic concept of the virtual prison camp. What are its creators trying to show? What do they want their visitors to take away? How will Gone Gitmo help promote discussions about the “larger questions the site represents”? What kinds of questions should be asked? At least in the blog post, these answers are not clear, which is a shame because this project has a lot of potential in promoting discussion on a subject long considered “taboo,” especially since 9-11.